Is it just me, or is Curtis Stone everywhere right now!? I've been a fan since his days on Take Home Chef, and recently he's hosted the Miss USA Pageant and been a contestant on Celebrity Apprentice. So, when I got the chance to meet him and this year's Kitchen and Bath Industry Show in Chicago, saying that I was excited is an understatement! At cooking demos hosted by Merillat, Curtis did what he does best: shared his cooking skills. Here's one of his featured seafood recipes from his cookbook, Relaxed Cooking with Curtis Stone. And be sure to check out all the hot new kitchen products I found at the show on MyHomeIdeas.com! Place a large wide pot over medium heat. Add the chorizo and saute for about 8 minutes, or until golden brown. Add the shallots and garlic and saute for about 2 minutes, or until fragrant. Add the mussels and toss quickly to coat. Cover the pot and cook over medium-high heat for about 3 minutes, or until mussels begin to open. Add 3 tablespoons of cilantro and toss to combine. Using a slotted spoon, transfer the mussels and sausages to a warmed large serving bowl. Boil the juices remaining in the pan for 1 minute. Then whisk in the butter. 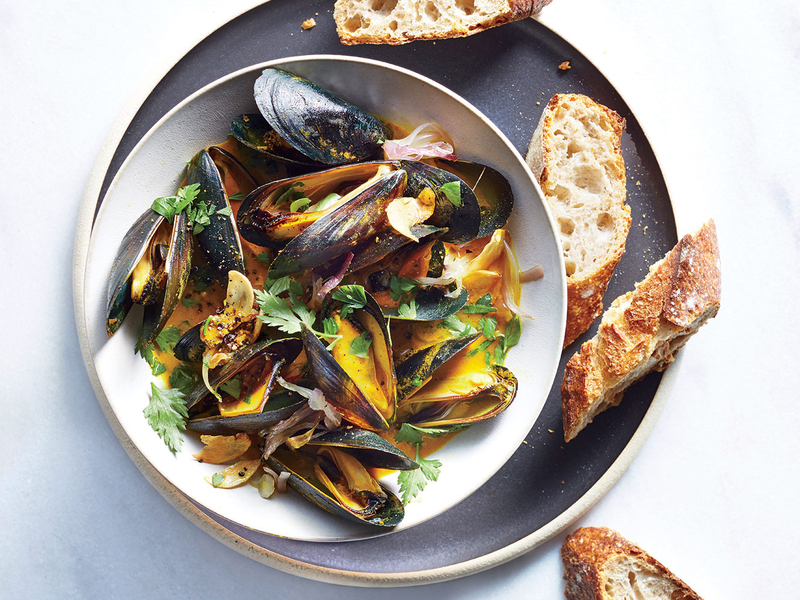 Pour the sauce over the mussels, sprinkle with the additional cilantro and serve immediately with the baguette pieces.